1. In a nonstick wok or large nonstick pan, add canola oil and preheat over medium-high heat. Stir in cooked chicken and scallions; stir-fry for 1 minute. 2. Add cooked rice, frozen peas (breaking them up) celery, and soy sauce. Cook for about 3 minutes until heated through, tossing gently to coat all ingredients. Push rice mixture to the sides of wok or pan. Add egg whites to center of wok. Cook and stir about 1 minute or until the eggs are completely cooked. 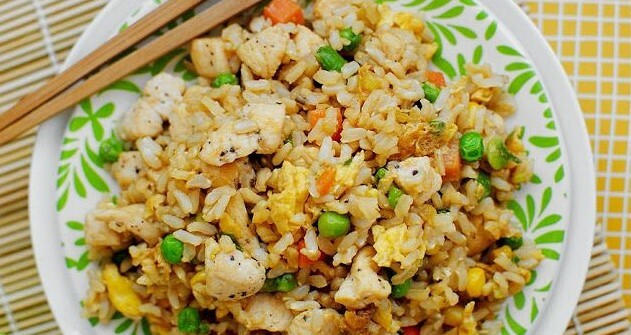 Mix eggs into rice mixture. Add sesame oil, a little black pepper and stir fry ingredients all together. 3. Serve immediately. Store leftovers in refrigerator for up to 2 days.